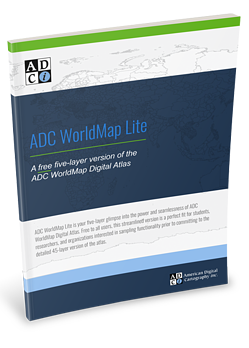 If you’re looking for a free background mapping tool or want to sample the functionality of the detailed 45-layer ADC WorldMap Digital Atlas, ADC WorldMap Lite is your solution! Streamlined to five layers and free to all users, ADC WorldMap Lite allows you to access capitals, cities with populations exceeding 900,000, oceans, generalized world admin and nations in your choice of formats — .shp, .gdb, or .tab. Learn more about ADC WorldMap Lite by requesting a handy fact sheet. Simply complete the form to access your copy now!